The temple complex of Karnak was built over a time period of 1500 years and was the most important place of worship in ancient Egypt. The site is huge, measuring 1500 x 800 meters, and is a spectacular complex of sanctuaries, kiosks, pylons and obelisks, all dedicated to the Theban gods. 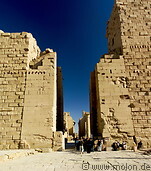 This gallery contains a selection of photos the temple of Karnak complex, taken during two visits in 2001 and 2003.